Warm, homey 3 bed/2 bath chalet centrally located in an unbeatable location. PRIVATE.SECLUDED. ONE-OF-A-KIND PROPERTY Cancellation policy: 10% cancellation fee of paid amount; 50% deposit; balance due 90 days before summer, 30 winter after which there is no refund. We recommend trip insurance for your contingencies. The three chalets are each private and secluded on five acres of hillside among spruce, hemlock, birch and willow trees over-looking Trail Lake in the CHUGACH NATIONAL FOREST. Each has it's own hot tub and will accommodate parties of 1-22. 15 minutes to Cooper Landing; 30 to Seward; 1 hour to Whittier, Prince William Sound, Alyeska, and Soldotna & the Lower Kenai; 2.5 hours to Homer; and 90 minutes from Anchorage. Relax surrounded by snow-capped mountains, overlooking turquoise-colored Trail Lake. The world-famous KENAI & RUSSIAN Rivers are just minutes away - world class fishing for salmon and trout, or rafting and bear viewing. KENAI FJORDS NATIONAL PARK, EXIT GLACIER & HARDING ICEFIELD, and saltwater fishing on Resurrection Bay are also only minutes away. Superb HIKING/mountain BIKING trails through lush forests to alpine meadows blanketed with wildflowers beside crystal clear snow-melt streams, waterfalls, ponds and lakes surrounded by glaciated mountain majesty are minutes away. Our beautifully appointed, comforts-of-home-and-then-some chalet is your ideal home base for adventures on the Kenai Peninsula. SNOWMOBILING, Nordic and Alpine SKIING and BOARDING just out the door for your daytime adventures in the world famous Chugach Mountains back-country. Relax watching the sunrise and alpenglow paint the mountains the full palate of Alaskan winter colors. Soothe your winter aches in the HOT TUB under a dazzling star-lit sky- and if you're lucky, catch the NORTHERN LIGHTS. The hot tub is the best place to catch seasonal meteor showers and the aurora away from city lights. Lifelong Alaskans who enjoy sharing our piece of Alaskan heaven! 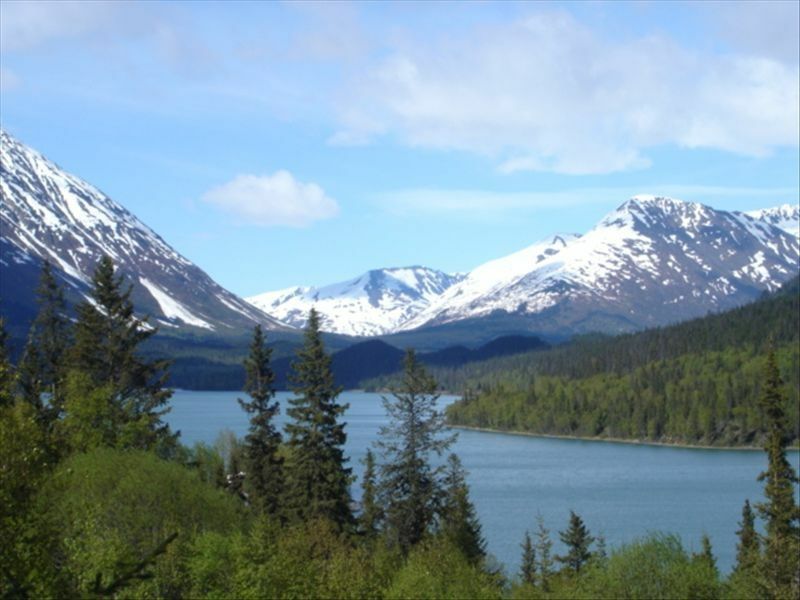 The Kenai Peninsula is all the best of Alaska in one place! Awesomely stunning view of Trail Lake and surrounding mountains. The chalets sit secluded from each other and any neighbors high on the hillside on five acres. Nordic skiers can leave from the chalet and ski across the lake. Same for snowmobilers. We very much enjoyed our stay. The owners had an employee greet us, who was very accommodating and welcoming. The property has 3 floors: 2 Bed rooms on the lower level and a large loft on the upper level. Kitchen, dining area/living area on the second level. We were very pleased. An amazing stay at the Steller Jay! We so enjoyed our time at Moose Pass chalets we actually extended our stay. We stayed at the Steller Jay. We found the chalet to be clean, beautiful, and well-stocked. The view from the main room was just gorgeous. In fact, some of our most stunning shots from our week were of that view. The Moose pass area was convenient to locations from Anchorage to Homer to Seward. On-property staff welcomed us, answered questions, and provided information throughout our stay We were greeted on our first day with homemade creme brûlée French toast and stacks of pertinent information about the area. We had the vacation of a lifetime in Moose Pass, and will likely return one day. Just what we hoped for and better than elected! A cozy, warm and inviting chalet ... clean and well maintained. The view and the hot tub were perfect and great location on the Kenai Peninsula! Would definitely recommend and go back! The house was very clean and well maintained. The on-site host was outstanding and readily available. My family and I really enjoyed our time here and highly recommend it to others. It’s about 40 minutes from Seward which isn’t bad at all. I would absolutely stay here again. The Stellar Jay "Resort" was the perfect place to explore the wilderness, Kayak, Hike, relax, and enjoy family. This was the second time we've stayed here and hope to come back as soon as we can. The kitchen was well stocked with everything we needed, from spices to pots and pans to dinnerware, everything was there. It was a wonderful experience! We stayed in the Stellar Jay the last week of June and it was the perfect place for our family of 5 (3 kids). There was plenty of space and the views were amazing. I sat on the upper deck every morning having coffee just looking over the lake and mountains. This was probably the best stocked vacation rental we've ever had. Muffins were left for our arrival, and Laura was a wealth of information about the area and was there for anything we needed. The hot tub was definitely a nice touch for the kids after long days of sightseeing. We found this to be a very convenient middle location for our plans. Seward was about 20-30 minutes down the road, which was nice for groceries and activities/restaurants. We'd definitely stay here again. Glad you enjoyed our chalet. We'd be glad to welcome you back in the future. Additional chalets on adjacent property will accommodate up to 12 people. Can accommodate parties up to 22 between the three. 3% discount for eChecks on base rate.